Ask most divers what causes the bends, or decompression illness (DCI), and the chances are that the response will be along the lines of rapid ascent, or perhaps staying too long at depth. A factor that seems rather under appreciated, though, is just how much of a role dehydration can play in the development of a bend. I was told recently by a hyperbaric doctor that after rapid ascent, dehydration is the second most common cause of DCI. This is the story of how I came to be having that conversation with a hyperbaric doctor, just before I stepped into a recompression chamber to be treated for a bend. It’s also the story of another danger, denial. These two things, Dehydration and Denial, I’ve come to know as the dangerous Ds. 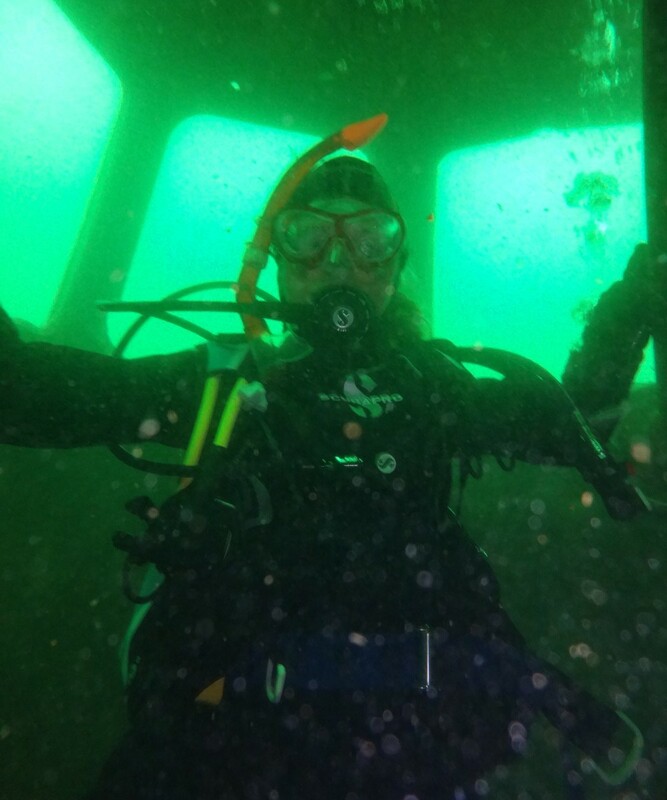 Back in July Sophie and I set off to Stoney Cove for a day of fun diving. Armed with our shiny new drysuits we wanted to practice the skills we’d recently learnt in the PADI drysuit course. It was a gorgeous day, bright and sunny, 24°C in the shade, doubtless a lot more out in the sun. We planned to dive the Staingarth, a wreck at about 21m, and knew it would be a lot colder down there. About 11°C as it turned out. So I put on a full Thinsulate™ ‘teddy bear suit’ under my drysuit. I’d not used this undergarment before, having used a much thinner fleece suit during training. I knew it would be more buoyant than the fleece, so put on a bit of extra weight and planned a buoyancy check as soon as we got in the water. It was hot in that suit in the bright sun. Really hot. We walked down to the water with our SCUBA, put on our gloves, hoods and fins and jumped. Quite why, having decided to do a buoyancy check, we didn’t take any spare weight with us to the water’s edge will forever remain a mystery, but that’s how it went. And you can probably guess what’s coming. I was under weighted. So I had to get out of the water and walk back to the car, in my already baking drysuit, with SCUBA and weights on, in the warm July sun, and fetch some more lead. By the time I got back in the water and had my weight trimmed I was absolutely roasted. Rarely have I been so relieved to jump into a cold quarry. We set off on the surface swim to the Staingarth buoy and began our dive. It was a good dive and we enjoyed exploring the Staingarth. On the face of it the profile was pretty unremarkable from a DCI point of view. We descended quite slowly down the shot line and after exploring the Staingarth headed off along the bottom in search of the Wessex (which we missed). It was a fair stay at 21m, but should have been fine. The ascent was good and slow, taking nearly 3 minutes to get from 21m to 6m for a 3 minute safety stop before surfacing. Back at the surface I took off my drysuit to find the undersuit absolutely drenched. My first thought was that the drysuit had leaked, but I then realised that the moisture was too evenly distributed, not concentrated around one point where a leak had been. It was sweat. After lunch and a 112 minute surface interval we went for a second dive. This time I went for thinner undergarments, not least because the Thinsulate™ suit was still drenched. At the water’s edge I got a burst of cramp in one hand as I was trying to get my gloves on. Cramp is strongly linked to dehydration and I really should have heeded the warning sign. But I didn’t. We dived. Another unremarkable profile. We dropped to 21m briefly to explore the Wessex, before coming back up to the ledge at about 6m and following that for the next 30 minutes or so—plenty of time to off-gas. But there’s more to a dive than the profile, and this one was full of problems. For me, all of them related to cramp. I had some of worse calf cramps I have ever experienced, at one point screaming in agony into my regulator whilst trying to massage them away. Perhaps the one good thing to come out this whole incident is discovering that I can have an experience like that underwater without panicking. It seems I perform well under pressure (credit to Dr Mike Gonevski for that cheesy pun!). I can’t really remember when the pains started, but over the next few days I began to notice deep, dull ’flu like aches in several joints—wrists, elbows, ankles and, oddly, the arch of one foot. They seemed to fade in and out, easing up in one place then coming on somewhere else. I was suspicious. I Googled DCI and read up on the symptoms. I looked at some of the dive forums. But I also really didn’t want to think it had happened to me. A combination of a seeming late onset, benign profiles, and the fact the pains kept moving helped me to convince myself that I didn’t have a bend. I left the pains untreated. After a week, maybe a bit more, they cleared up. I’ve since learnt that far from not suggesting a bend, pain migrating is actually a classic symptom of DCI. Fast forward six weeks and we headed back to Stoney again for my first dive since. This time a single dive, reaching 22m and then coming back up to 6m for the last 20 minutes. It wasn’t exactly a triumph of a dive—our communication was poor and my navigation even worse—but it was safe and sensible, with both our computers suggesting we had plenty of time left at 22m when we began our ascent. In the days to follow, however, the dull pains returned, this time focused in my wrists and thumbs. This was too much of a coincidence and when the pain worsened enough to wake me on Sunday night (the dive was on Friday) I guess I really knew what was going on. But by Monday morning it had eased off. It seemed such a trivial thing now that I couldn’t bring myself to disturb somebody’s bank holiday by making the call. My denial continued until late afternoon, when, pushed on by Sophie’s very sensible nagging, I called the Midland Diving Chamber. I went through my symptoms and history on the phone with Dr Mike Gonevski, who quickly formed the view that I had had a dehydration related DCI back in July. Because it went untreated my redundancy had been diminished, so a fairly ordinary dive had brought about a recurrence. We arranged for me to go to the chamber on Tuesday for a full assessment and treatment. The initial treatment followed Royal Navy table 66—a nearly six hour long session in the chamber starting off at 18m and then moving to 9m, breathing 100% O2 for most of the time. Yes, that’s right, a PO2 of 2.8bar. Sounds a bit scary when you’re used to thinking of 1.4bar as being the limit if you want to avoid oxygen toxicity, but as Spike, the tender who was in the pot with me, pointed out, there’s no risk of drowning in a chamber. Whilst I can’t say my ride in the ‘big white bus’ was the most thrilling six hours I’ve ever spent it wasn’t nearly as bad as I thought it would be. All the staff at the chamber were fantastic—welcoming, friendly and reassuring. 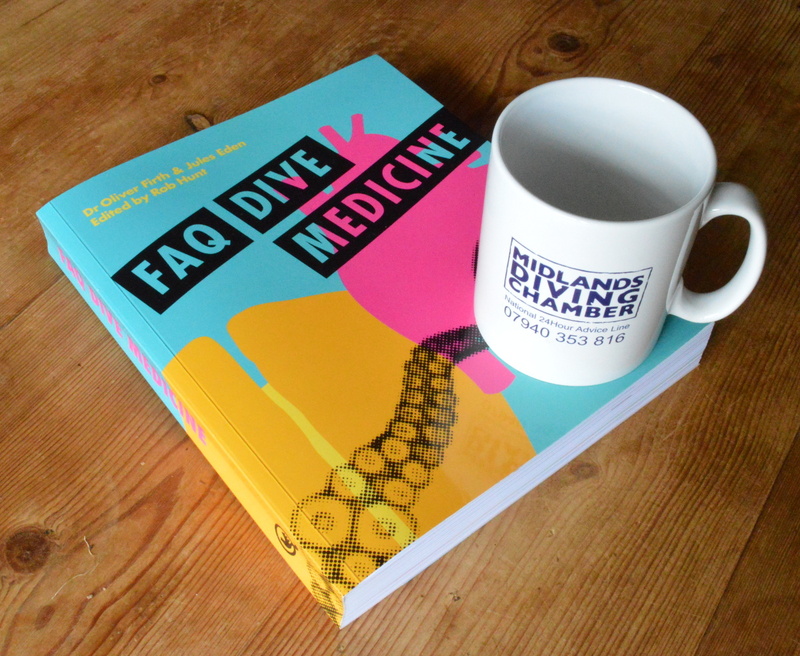 And I got to watch a Mock the Week video and eat a Thai takeaway, not to mention leaving with a souvenir mug and very amusingly written book on dive medicine. It’s certainly not something to worry about—far better to do it than not, as I’m discovering. Had I gone there straight away in July there’s a good chance that first session would have sorted everything. But because I left things it’s become a lot more stubborn. I’ve been back for shorter (1h45) treatments three times since, and although I felt pretty pain free this morning I can feel it edging back as I type this. Denying what was going on was certainly not the smartest move I’ve ever made. But it is on its way out now, and I have to say a big thank you to Spike, Dave, Robbie and Dr. Mike for getting me there. Dehydration: do not underestimate the danger of dehydration and the role that it can play in the development of a bend. Keep hydrated. Learn to spot the signs of dehydration and call the dive if you suspect you, or your buddy, are affected. If you’re dehydrated a perfectly innocent looking profile can take you to the chamber. Denial: do not deny that you have a bend. If you develop a pain shortly after a dive it needs checking out. Call the chamber. They don’t bite. Quite the contrary, they’re all really nice. And you may even get a takeaway out of it! At best, leaving things makes it worse and more difficult to resolve. At worst, it could kill you. This entry was posted in General and tagged bends, dci, dcs, decompression illness, dehydration, diving, scuba on August 31, 2014 by Chris.